You’ve decided you want to run Facebook ads and you’ve determined which objective to optimize your ads for. Now it’s the fun part: Deciding who should see your ads. This should, of course, be based on the goals of your campaign: What are you hoping to get out of these ads? What are you hoping your targets will do? This will inform who your ads should be sent to. Facebook ads are different from other ads (like billboards, print ads, or TV ads) in that you only pay for the eyeballs you want to see your ad – and at a much lower price point! Bonus: Facebook ads are measurable in a way that the other ads aren’t, so you have a much better sense of how your targets view and receive your ads. 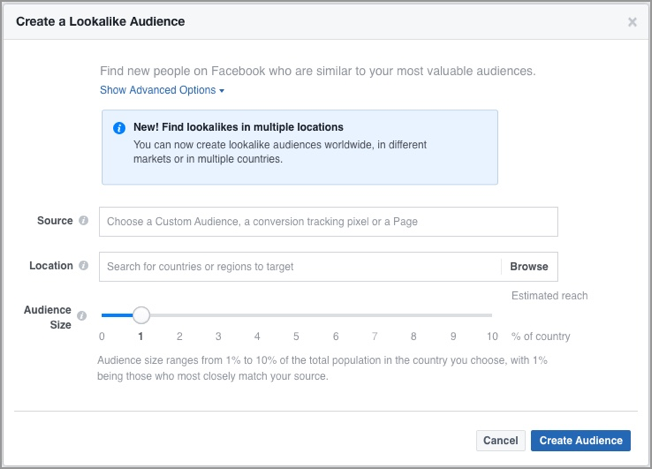 Lookalike Audiences are great to consider if your organization is just starting to dip its toes into Facebook advertising. With Lookalike Audiences, you would upload a Custom Audience (such as your email list or a segment of your email list), and Facebook can help identify users with similar interests. “Smaller audiences more closely match your source audience. Creating a larger audience increases your potential reach, but reduces the level of similarity between the Lookalike Audience and source audience. We generally recommend a source audience with between 1,000 to 50,000 people. So, are you trying to find audiences that behave a lot like some of your top online donors or those most likely to sign one of your online petitions? Lookalike Audiences could be a good bet for you. With this enhancement, advertisers are no longer limited to creating small groups of audiences based on their spend or LTV (lifetime value) prior to creating a custom audience. 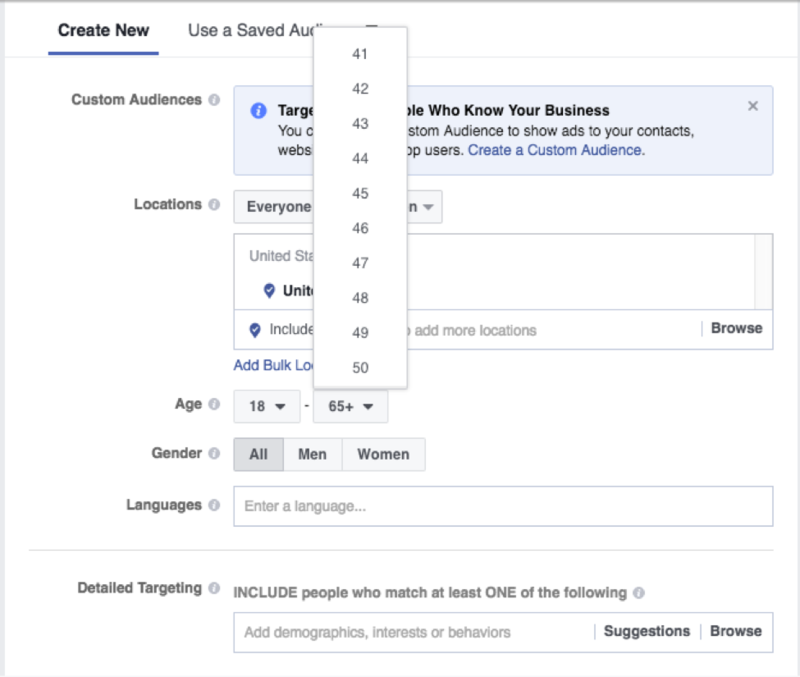 Now they can include a value column to their entire customer list, which Facebook can use to create an additional weighted signal for people most likely to make a purchase after seeing your ad. Value-based lookalikes can be found across all objectives in Ads Manager or Business Manager. For how to create a Lookalike Audience, check out Facebook’s resource here. Many of the organizations that we work with have indicated that their audiences largely skew older. In order to stay relevant as these audiences continue to age, it could be strategic to start building a younger fan base for your organization. One way to start getting your organization in front of younger generations is to target Facebook ads to them. This part is easy. As you’re creating your new audience, just adjust the “Age” variable to the ages you’d like to include. We generally start our targeting for younger audiences at age 18: voting age. Don’t forget to frame your content in a way that will resonate with this younger audience; don’t just use the same content you’d use with your existing fan base. Wondering what that content looks like or what will resonate most? Well, that sounds like a great A/B test to us! Are you doing state-level work, such as a ballot initiative? Spend your money more effectively by targeting just the people who live in that state. 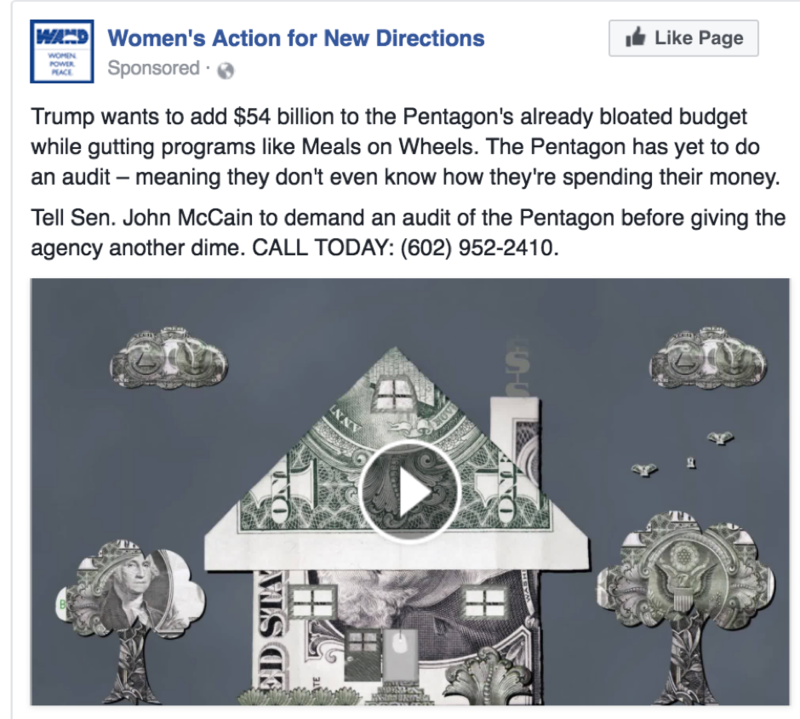 For example, Women’s Action for New Directions targeted this ad to progressive women in Arizona, encouraging them to call Sen. John McCain (one of the targets on their whip list) and demand a Pentagon audit. Bonus points: WAND included the phone number for Sen. McCain’s district office, which is often a good strategy to reach congressional staff, as the district office is much less inundated with requests and calls than the DC office. When you’re creating your new audience, just start typing in locations. This could include countries, states, regions, cities, postal codes, DMAs, or – wait for it – Congressional districts. Working to influence policy, it’s no surprise that some nonprofits will want to target based on a user’s political affiliation. You can target based off of users’ self-reported political allegiances or those identified by Facebook based on user behaviors (or both!). This could help you test how various audiences respond to a given message or whether there are messengers that are more compelling for a given political audience. For example, we have run ads with the same message to liberal, very liberal, moderate, and conservative audiences to see how they responded—and learned some fascinating things about both our base audience and our persuadables. We then used these insights to further refine our message and strategies for these audiences. Stay tuned for our upcoming blog post on A/B testing to learn more. There are a few ways to do this (all in the “Detailed Targeting” section). From there, you can select from Facebook’s identified “Likely to engage in politics” – by Conservative, Liberal, or Moderate signifiers. You can also target based upon users’ self-reported politics: Very liberal, liberal, moderate, conservative, or very conservative. 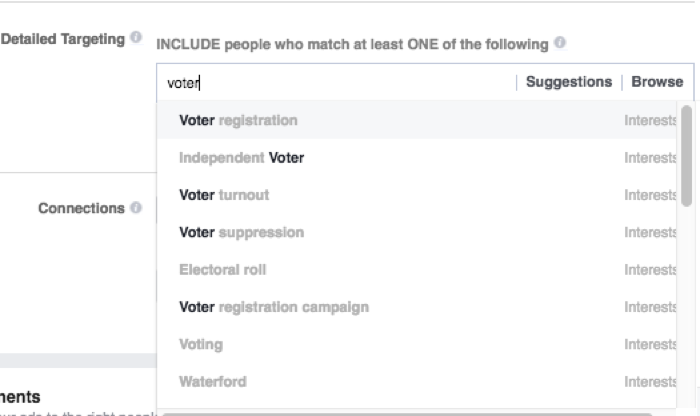 You can also just start typing in political classifications to see if Facebook has that option for targeting. These can include: Libertarian, Democratic Party, Republican Party, and the names of specific lawmakers, such as Elizabeth Warren, Bernie Sanders, or Rand Paul. Finally, there are companies that can pair your Facebook targeting with users’ voting records. Learn more about that here. This is one of my favorite ways to target people because it involves more social psychology (and lets you tap into existing user networks). You could also target people interested in the organizations working on voting rights, including the Lawyers’ Committee for Civil Rights, Common Cause, the Advancement Project, and Rock the Vote. 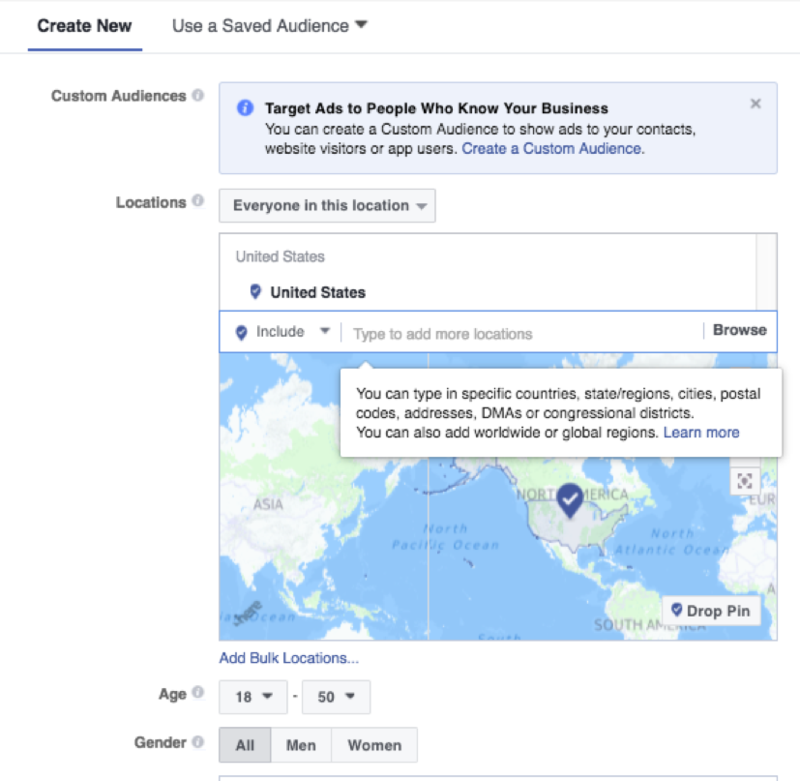 Just like with the political targeting, when you’re creating your audience, scroll down to “Detailed Targeting.” From there, you can just start typing into the search box and see Facebook populate options for you. Just click on the ones you want, whether it’s an interest, employer, or other designation. This is one of the more controversial ways to target on Facebook. Targeting by Affinity is one way to reach more diverse audiences. What we get in its place is audience “Affinity.” Based upon a user’s activity, Facebook says that a user has an “Affinity” for a given culture or ethnicity. So, let’s say you were hoping that your campaign could reach more African-Americans or Asian Americans. Rather than singling users out by race, you could identify behaviors that are aligned with an interest in issues affecting African-Americans or Asian Americans. Facebook is pretty tight-lipped about what activity would designate someone as having an affinity, and it’s by no means a precise way of targeting (on purpose). But it is a step we can take to try to reach more diverse audiences with our messages. For more on Affinities, check out Facebook’s resources here. Of course, these are only some of the many ways to target on Facebook. And don’t feel like you have to pick one these ideas – or just one idea: You can add multiple characteristics to further refine your audience. You can add “AND” OR “NOT” designations to limit your audience, as well. What targets have you tried or are you interested in testing for your campaigns? Tweet to us @rethink_media and let us know!